Happy Good Friday. I was planning to show you some updates to my home office, but I decided to hold that off until Monday. 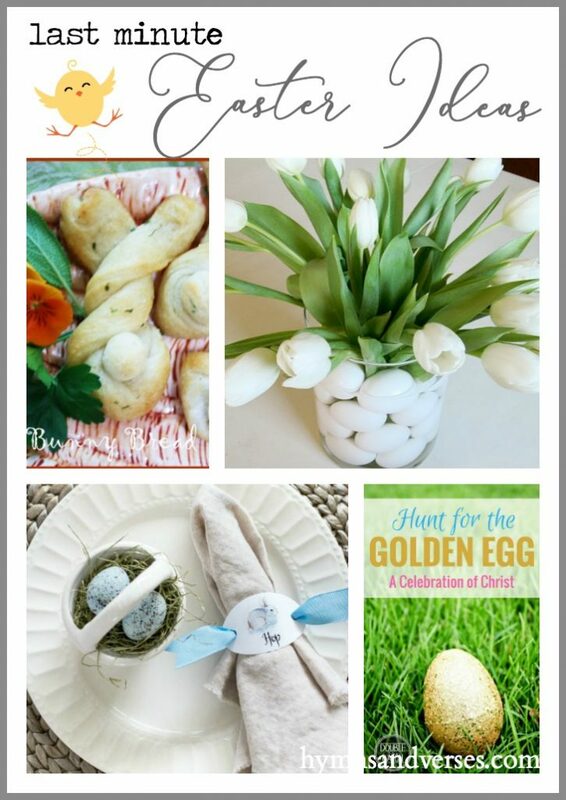 I was scrolling Pinterest for some last minute Easter ideas and thought I’d share some of them with you! These are things that take very little effort and time, because who’s got extra time this close to Easter! So, here are a few things that caught my eye! I’ve included the link to each photo. 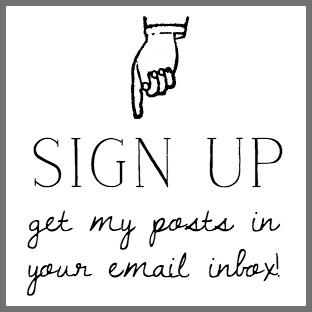 Please visit the original maker and pin from their site – thank you! 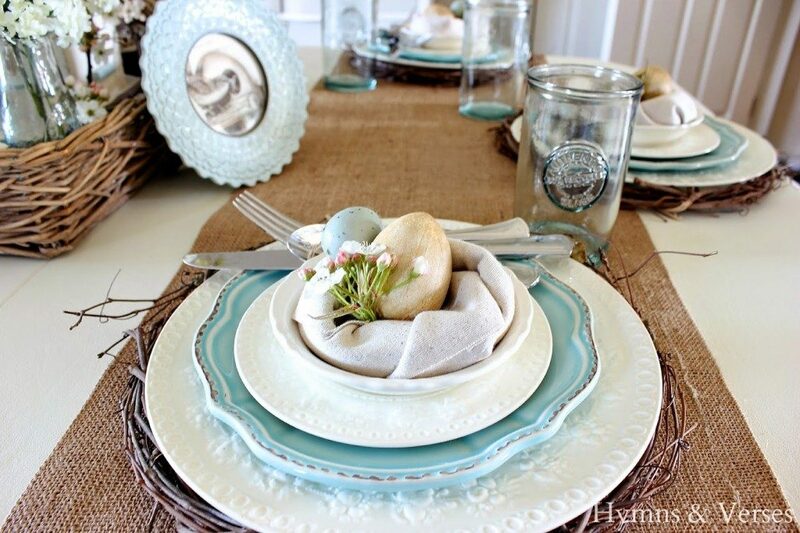 Aren’t these printable napkin rings adorable! There are several designs and they are all lovely! 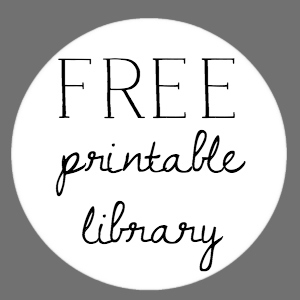 Visit Ann, On Sutton Place to get this download! Have you seen these adorable bunny rolls? Most recipes I found were “bake from scratch” yeast bread and I know I don’t have time for that this weekend! 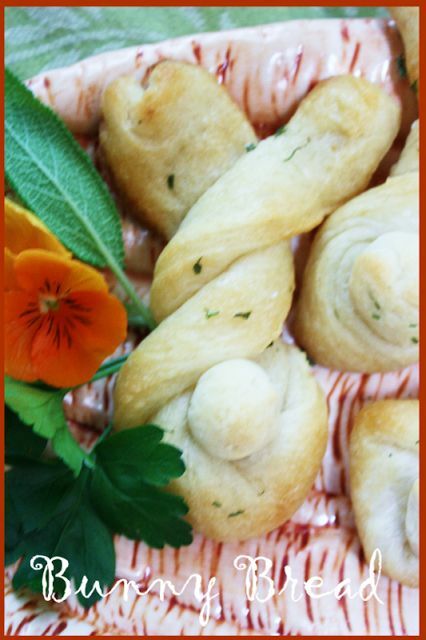 But, Yvonne of Stone Gable made these cute bunny rolls with refrigerator breadsticks!!! Now, I can do that! So, I’m serving these cuties up this Sunday! When my kids were little, I always tried to incorporate fun things that taught them the resurrection story in a way they could understand. Here’s a new idea that I haven’t seen before. 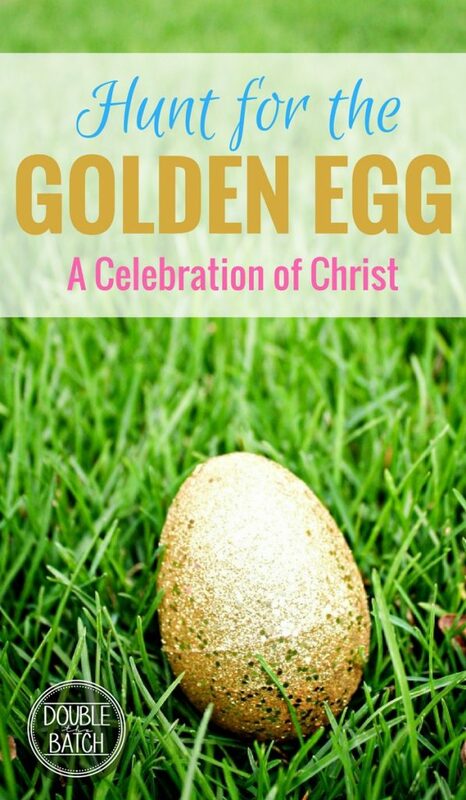 It’s a Hunt for the Golden Egg by Uplifting Mayhem! I think this could be put together pretty quickly for your Easter Sunday egg hunt! Finally, here are are couple centerpiece ideas from my archives that are so easy to put together! And, you can get what you need while shopping for your groceries! 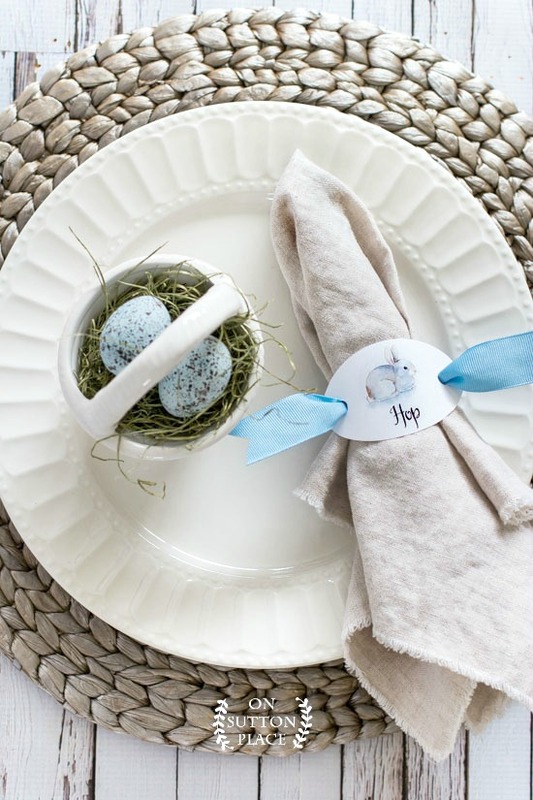 With the bird nest napkin fold, write the person’s name on the egg for an instant place card! Also, remember that the chargers I used in the above photo are just grapevine wreaths I found at the Dollar Tree – another quick idea! I hope you all have a blessed Easter weekend whoever you spend it with! Have fun with the egg hunts, getting dressed up, and yummy Easter meal – but spend some time to reflect on the gift of eternal life that came with great sacrifice. A very blessed Easter to you. 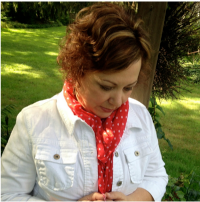 Thank you for this wonderful post including the song..so touching! Thank you for all of the last-minute ideas, Doreen. (This is the first year I have not put together Easter baskets for my kids. The youngest is now 22; it was time, lol). Happy Easter to you and your family. He is risen! Thank you for these great ideas. I am a grandmother and my decorating days are nil but i am taking cupcakes for my grandchildren, ages 10-19. Thank you for that song it was a blessing, just like Easter is a blessing for we as Christians, have a wonderful Easter with you family. My dear husband still insists on receiving a Easter basket every Easter and he is 54 years old! I am glad he shares too! 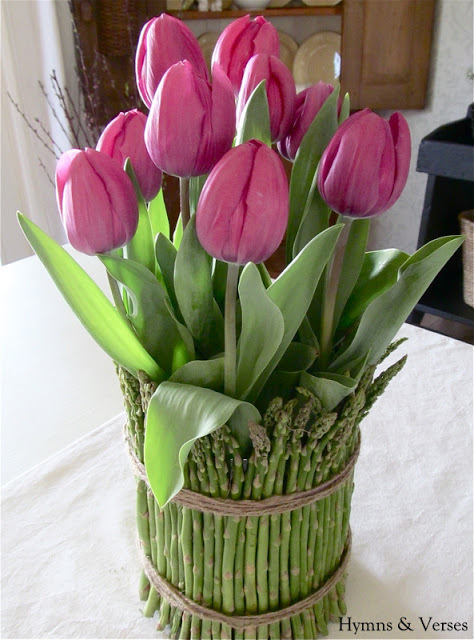 I love the tulip and asparagus centre piece. 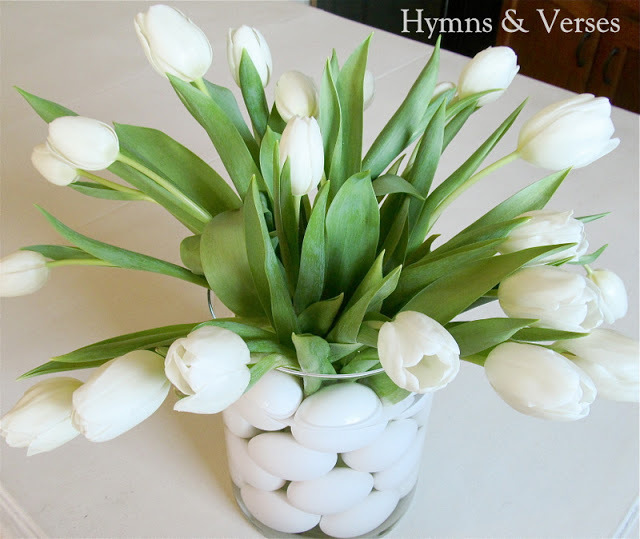 I hope to get some tulips for my table. Thank you for all the great ideas. I hope you and your family have a wonderful Easter. Christ is risen He is risen indeed. Can’t help but lift my hands every time I hear that song! Peace and blessings as you celebrate the Lord’s resurrection. Have a blessed Easter. Thanks for the song!